This week's issue of Creative Loafing (online today and on newsstands tomorrow) features a cover story on Charlotte's comedy scene. I wrote one of the articles that comprises the feature package. I spent time with comedian Tone-X--even hung out backstage at one of his comedy shows--and chronicled in the article what motivates this popular comic, how he's evolved over the years, and how he keeps people's stomachs hurting from laughter. 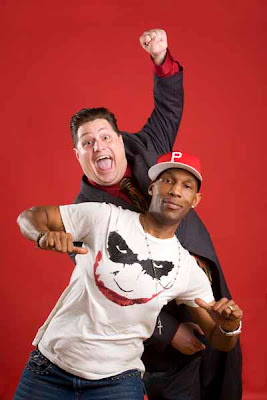 Charlotte comedians Tone-X and Johnny Millwater, photographed for Creative Loafing's Comedy Issue. Click here for "The Comedy Issue" and in it you'll find a link to my article on Tone-X.